Kaigansan Koyain Anyoji Temple is a bery beautiful temple near Edogawa River. The name Kaigan means 'sea shore', so it was built near the sea shore of Koya where the salt industry had been flourished in. 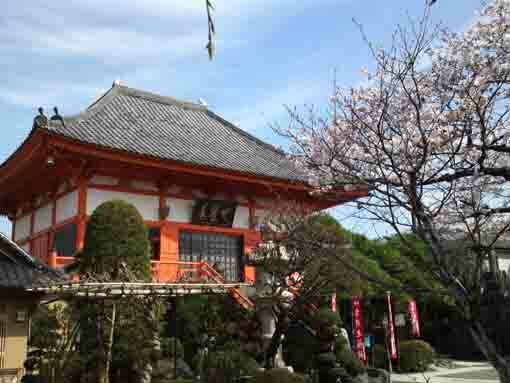 Anyoji Temple tells the history of Koya. 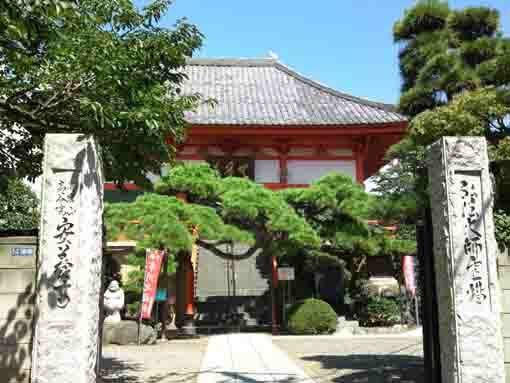 Passing through the gate, a long branch of a large pine tree spreading over the red columns of the main hall like clouds in a Japanese classic color print gives unique atmosphere. A statue of Hoteison welcomes visitors with his big smile. 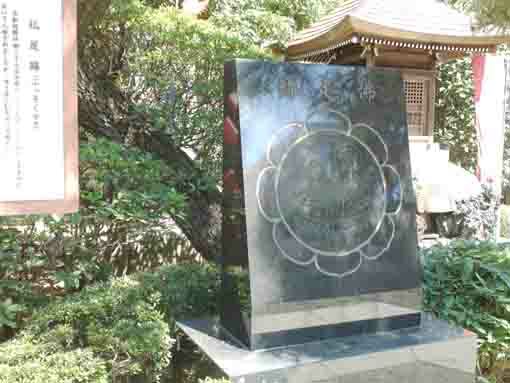 Moreover, there are a stone tablet scribing footprints belonging to Buddha, a monument for old brushes and so on. 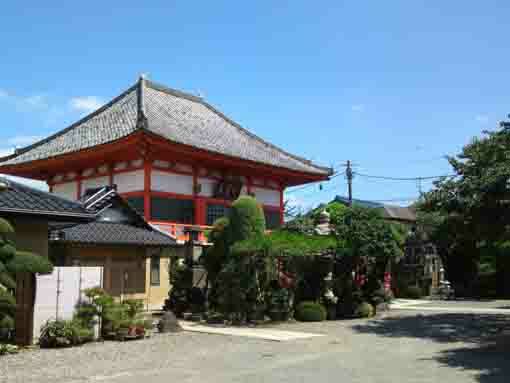 And Anyoji Temple is called 'Hadashi Daishi' by neighbors faithfully. 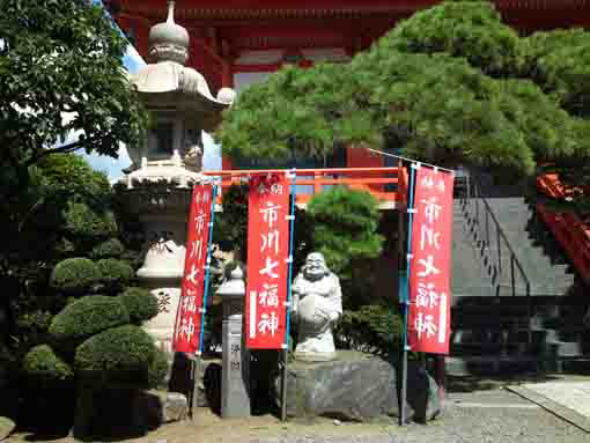 Kaigansan Koyain Anyoji Temple is the 12th temple of the 33 Pilgrimage in Gyotoku and Urayasu and belongs to Ichikawa Shichifukujin (Seven Gods of Good Fortune). 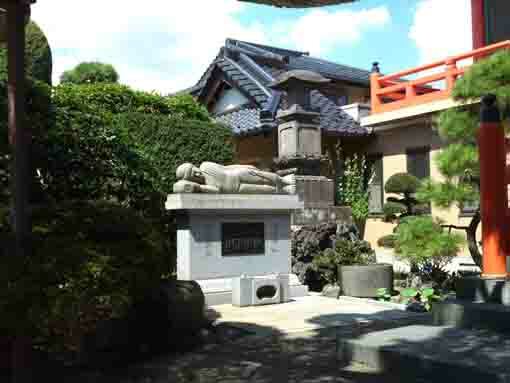 Why don’t you visit Kaigansan Koyain Anyoji Temple? Kaigansan Koyain Anyoji Temple is an old temple built in 1534 in Sengoku Period. It belongs to Buzanha in Shingon Sect.The title Kaigansan means 'sea shore', so it stood near the sea shore of Edo Bay (Tokyo Bay) when it was built. 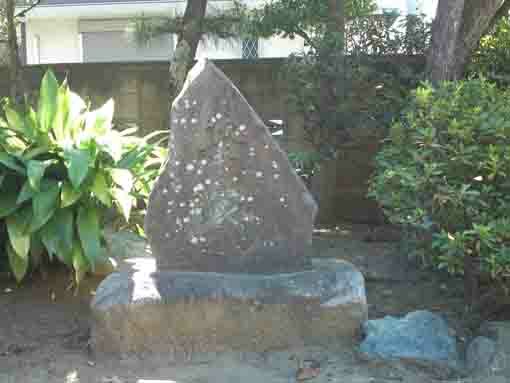 During Edo period, Koya area in Gyotoku where Edo Bakufu directly managed flourished with the salt industry. Though the scenery has been dramatically changed in Gyotoku area since the Edogawa Drainage Channel was dug in 1919 and the sea shore around it was reclaimed while the development of the industry after the Meiji Restoration, there are some Japanese traditional houses remaining in the area around Anyoji Temple and they tell the history about Edo period and Meiji era. Anyway, Issa Kobayashi, the famous haik poet, visited Anyoji Temple in Edo period. Kaigansan Koyain Anyoji Temple is also called 'Hadashi Daishi (barefoot Daishi)' faithfully, there are 88 stones from temples belonging to the 88 Pilgrimage in Shikoku buried in the corridor in the main hall, so visitors could receive blessing the same as visiting the 88 Pilgrimage in Shikoku if they would go around the corridor barefoot faithfully. Moreover, a stone tablet scribing the footprints belonging to Buddha under the main hall and a monument for old brushes beside the gate. 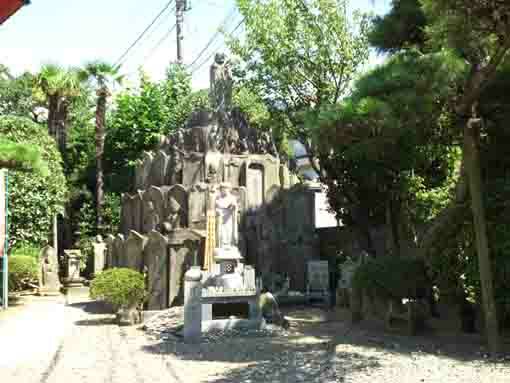 Kaigansan Koyain Anyoji Temple is the 12th temple of the 33 Pilgrimate in Gyotoku and Urayasu and also belongs to Ichikawa Shichifukujin (Seven Gods of Good Fortune), it dedicates the stone statue of Hoteison. Hoteison is a god with a potbelly who is one of Shichifukujin (Seven Gods of Good Fortune). He really existed in Tangu Dynasty in China and he was a Buddhist priest belonging to Zen Sect. His name was Keishi, pseudonym was Cho Teishi. He always looked very happy and had large stomach. And Hoteison was famous for a trainee monk travelling around with his fabric bag on his shoulder. He has much treasure in his bag, so people believe that people in a certain area where Hoteison would visit could get good fortunes. Hoteison is considered to be an incarnation of Miroku Bosatsu who appears to save people in the end of the world. In Japan, the belief of Hoteison spread in Muromachi period as a member of Shichifukujin by the imported Zen paintings from China. Hoteison is the god of bringing good fortune, childbirth and match making. 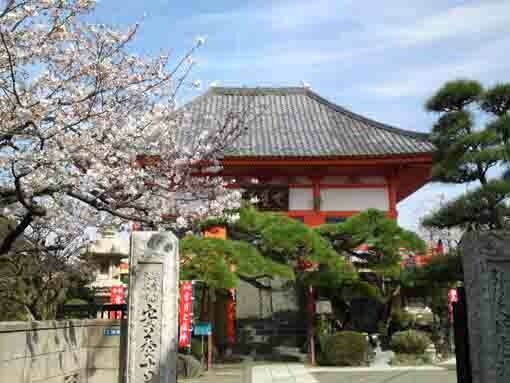 Anyoji Temple has a great accessibility from both Narita and Haneda International Airport. From Narita International Airport, take JR Sobu-express line, transfer the line at Nishi-funabashi to Tozai line of Tokyo Metro bound to Nakano or Mitaka, get off Baraki-Nakayama Sta. And also take Keisei-line, transfer the line at Funabashi to Sobu-Local line, and transfer the line at Nishi-funabashi to Tozai line of Tokyo Metro bound to Nakano or Mitaka, get off Baraki-Nakayama Sta. It takes minimally 50 minutes from Narita Airport. From Haneda International Airport, take Keikyu-line bound to Narita, transfer the line at Nihonbashi to Tozai line of Tokyo Metro bound to Nishifunabashi, Tsudanuma or Katsutadai, get off Baraki-Nakayama Sta. From Tokyo (Otemachi) Sta, take Tozai line of Tokyo Metro bound to Nishi-funabashi, Tsudanuma or Katsutadai, get off Baraki-Nakayama Sta. From Akihabara Sta, take Sobu line bound to Chiba, Tsudanuma or Nishi Funabashi, transfer the line at Nihonbashi to Tozai line of Tokyo Metro, get off Baraki-Nakayama Sta. Take 10 minute walk from Barakii-Nakayama Sta.